Hello. A new set, Core Set 2019, has been released not to long ago. 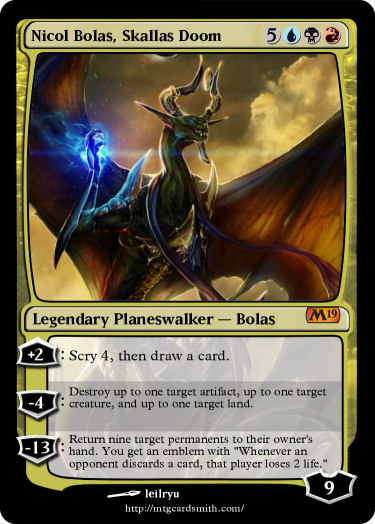 I was thinking that we could have a challenge for this here by making a Planeswalker card that is either Tezzeret, Ajani, Sarkhan, Vivien, Liliana, or Nicol Bolas. Which are the 6 Planeswalker types that appeared in Core Set 2019 out of the 11 Planeswalkers made. -First Place will get 3 Favorites and a Follow. -Second Place will get 2 Favorites. -Then Third Place will get 1 Favorite. -MTG art that already exists can be used as it can be difficult to find art sometimes for this. I will show examples if need. 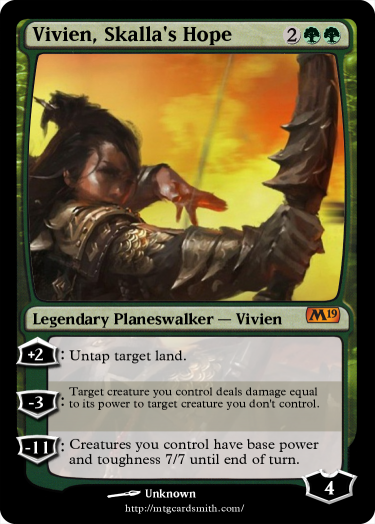 So, when you say one per planeswalker type, do you mean the character? @WickedShadow196, you mean the ones in the real m19 set? Right? @Ranshi922 Yes as in these ones: Tezzeret, Ajani, Sarkhan, Vivien, Liliana, or Nicol Bolas. 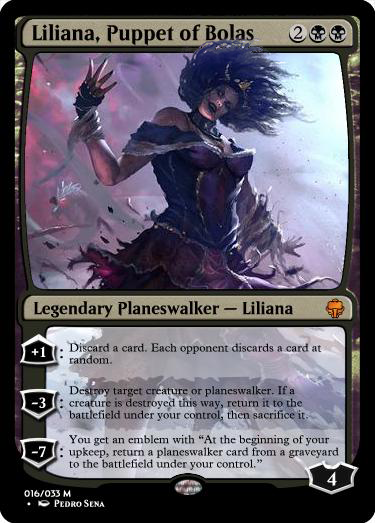 My first entry is Liliana! 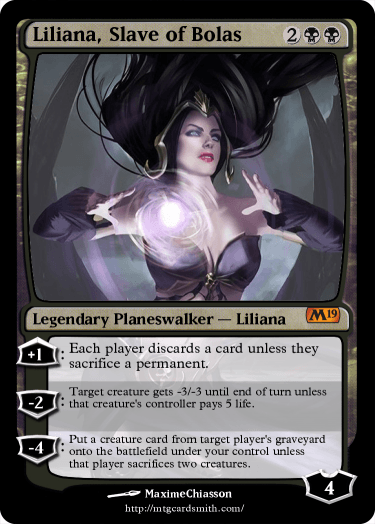 Here's a Liliana (by using MtG.Design). Q: But Lili is being controlled by Bolas and she must be mad hurr durr? A: That doesn't mean she has to become a crazy-looking person. Bolas has thousands of ways of controlling people aside from forcing it directly to someone's mind. Ok @Fallen_Lord_Vulganos Lets talk about the people Nicol Bolas controlled. Who did he not make insane when he controlled them. Sarkhan and Tezzeret seem to hate literally everything. But I do hope the Raven Man does come out for the solution to his Liliana problem in the next set. Tezz seems to be fine, although he's technically already marked (on his forehead) by the lord B. So the metal man can't betray the big evil dragon guy unless he wants to die. 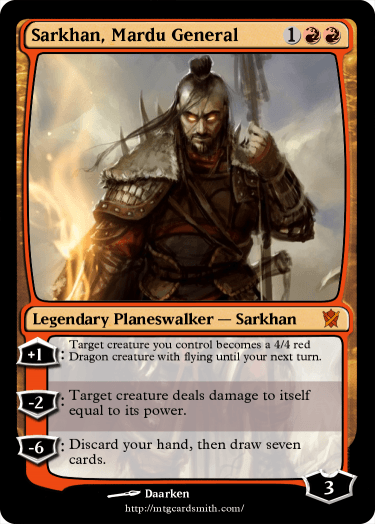 Sarkhan was brainwashed before, but now he's lost in another timeline and is currently ravaging the virginity of the wild dragons because he loves dragons so much. Probably. So he's out from the equation. Ral is probably also already marked for death by that evil dragon guy too if he somehow betray HIM later on. Not really know much about the electric man's latest history tho. And Liliana is also marked for death due to the contract obviously. So the necromancer chick could only comply HIM or get turned into dust because she's actually already centuries old.